All clients information is kept in-house and strictly confidential. The personal information collected from you during order processing (name, address, phone & fax numbers, email address and credit card number & expiration date) is used exclusively for contract, shipping and billing purposes. We do not share this information with outside parties except to the extent necessary to complete that order. OCEANFRONT GURU VACATION RENTALS does not share our customer's personal information with any third party. 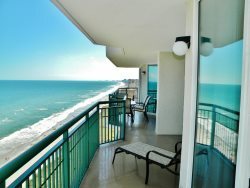 OCEANFRONT GURU VACATION RENTALS uses a secure server ensuring that all client information is safe. If you have any questions regarding the privacy and security practices of this site, call us.